PoPville » More info than you ever wanted to know about Bei Bei, but wishing him well!! More info than you ever wanted to know about Bei Bei, but wishing him well!! “Bei Bei started showing signs of abdominal discomfort overnight Saturday, Nov. 25, and as a result the panda team began monitoring him closely. All of his symptoms were consistent with a mucous stool–which include abdominal discomfort, nausea, decreased appetite and sleeping. He passed a mucous stool on Sunday, Nov. 26, and began eating and defecating normally again. The panda team has been monitoring Bei Bei continuously since Saturday. He has not expressed interest in spending time outside, and during the course of the day on Monday, Nov. 27, he again became reluctant to eat and his activity decreased. As a result, the panda team will continue to monitor him overnight and watch for any changes, or evidence of another mucous stool. Mucous stools are not uncommon for giant pandas. Bei Bei has passed several of them and Mei Xiang and Tian Tian also experience them occasionally. UPDATE: The panda team monitored Bei Bei overnight Monday and watched for any changes, or evidence of another mucous stool. His symptoms did not worsen overnight, but did not improve. He did defecate this morning, but as an extra precaution veterinarians will perform an exam this morning while Bei Bei is under anesthesia to take a closer look at him. The panda house will be closed today, but visitors can see Mei Xiang and Tian Tian in their outdoor yards. Bei Bei’s veterinary exam went very well. Veterinarians took radiographs, blood samples and a urine sample, and looked in his stomach and colon with an endoscope camera. There was evidence consistent with a mucous stool, but they did not find an intestinal blockage. The lab results were normal, except for some bacteria in his urine suggestive of a possible urinary tract infection. Dr. Josh Hobbs from Friendship Hospital for Animals performed an abdominal ultrasound, which confirmed these findings. Veterinarians suspect that Bei Bei continued to feel sick from his mucous stool on Sunday, Nov. 26, causing his reluctance to eat and decreased stool production. They gave him fluids and medication to alleviate his nausea and started him on antibiotics for a possible urinary tract infection. 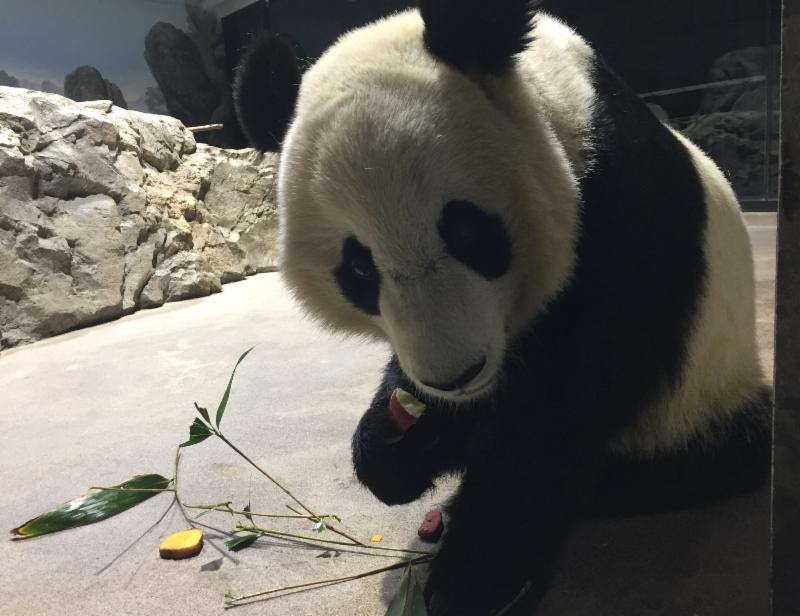 Bei Bei is back at the panda house and recovering well. Keepers will continue to monitor him for the rest of the day and overnight. They will start reintroducing tender pieces of bamboo and leaf-eater biscuits to him this afternoon, and encourage him to drink by offering him small amounts of diluted juice or honey water in a water bowl. Since he returned to the panda house he has urinated and defecated several times. The panda house will reopen tomorrow and visitors will be able to see Bei Bei, Mei Xiang and Tian Tian. Bei Bei will begin venturing outside again after keepers are confident that he is eating and drinking normally. Visitors will notice that he has a shaved patch of fur on his belly where veterinarians performed an ultrasound.